With premium BAQUACIL® pool care products, you can finally achieve the kind of clarity your pool was designed for in the first place. After all, BAQUACIL® brand does away with tedious pool care by enabling you to convert your pool into a chlorine-free, carefree sanctuary in less than 24 hours. The result? Clear, beautiful water that's gentle on eyes, hair and skin, not to mention pool surfaces and swimsuits. This is the power of the Baquacil CDX System. 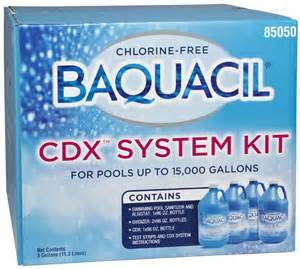 The BAQUACIL CDX System is a chlorine-free system specially formulated to maintain a consistent oxidizer residual in pool water. The oxidizer residual in pool water plays a significant role in removing contaminants that put a strain on the pool and keeping the pool clear all season long. Better still, this system is ideal for all pools.